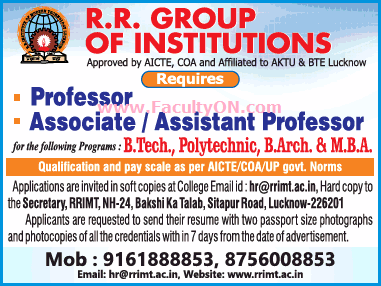 R.R.Group of Institutions, Lucknow has advertised in THE TIMES OF INDIA newspaper for recruitment of Teaching Faculty- Professor / Associate Professor / Assistant Professor jobs vacancies. Interested and eligible job aspirants are requested to apply within 07 days from 30th May 2018. Check out further more details below. About College: R. R. Institute of Modern Technology was founded in 2008 to become the “Institution of excellence”, However, academic activities in engineering college commenced in 2008 with a vision to develop a centre of excellence in the emerging area of engineering and technology. It is recently coming on its way to provide value based technocrats.